Spinal muscular atrophy (SMA) is caused by deletions or mutations of Survival Motor Neuron 1 (SMN1) gene. The nearly identical SMN2 cannot compensate for SMN1 loss due to exon 7 skipping. The allele C (C+/+) mouse recapitulates a mild SMA-like phenotype and offers an ideal system to monitor the role of disease-modifying factors over a long time. T-cell-restricted intracellular antigen 1 (TIA1) regulates SMN exon 7 splicing. TIA1 is reported to be downregulated in obese patients, although it is not known if the effect is gender-specific. We show that female Tia1-knockout (Tia1−/−) mice gain significant body weight (BW) during early postnatal development. We next examined the effect of Tia1 deletion in novel C+/+/Tia1−/− mice. Underscoring the opposing effects of Tia1 deletion and low SMN level on BW gain, both C+/+ and C+/+/Tia1−/− females showed similar BW gain trajectory at all time points during our study. We observed early tail necrosis in C+/+/Tia1−/−females but not in males. We show enhanced impairment of male reproductive organ development and exacerbation of the C+/+/Tia1−/−testis transcriptome. Our findings implicate a protein factor as a gender-specific modifier of a mild mouse model of SMA. This article is published as Howell, Matthew D., Eric W. Ottesen, Natalia N. Singh, Rachel L. Anderson, Joonbae Seo, Senthilkumar Sivanesan, Elizabeth M. Whitley, and Ravindra N. Singh. 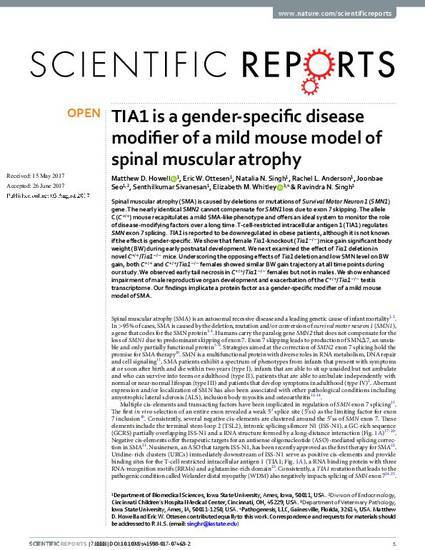 "TIA1 is a gender-specific disease modifier of a mild mouse model of spinal muscular atrophy." Scientific reports 7 (2017): 7183. doi: 10.1038/s41598-017-07468-2. Posted with permission.